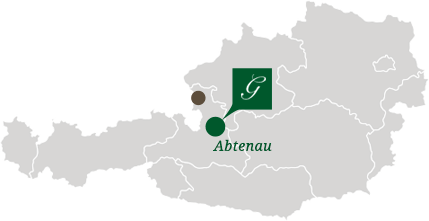 Abtenau sends its greetings! – Enjoy your pure summer pleasure! In Abtenau and its surroundings, guests of the Active and Wellness Hotel Gutjahr in Salzburg Land will enjoy a wide variety of sports – but also culture lovers and comfort seekers find their interests at the family-friendly destination. In short – experience the diversity of the most wonderful holiday region of Salzburg Land! Welcome to one of the most attractive hiking regions of the Alps! Go up to the hill farms by using the modern gondola lifts! Numerous hill farms attract with fresh buttermilk, hearty snacks, mountain bacon, grey cheese or sweet cut-up pancakes as a culinary treat. In the Tennengau you may find a 720 kilometer-long and excellently signposted network of routes, for example the Dachstein course in the border triangle of Upper Austria – Salzburg – Styria or the Watzmann-Hochkönig-course and the three-day hill farm tour in Salzburg. Altogether, our region offers 22 mountain bike tours with different levels of difficulty. In connection with the neighboring MTB-territories Salzkammergut, Berchtesgadener Land and Salzburg world of sports, your stay at the Active and Wellness Hotel Gutjahr in Abtenau provides you with not less than 150 routes and a 3.000 kilometer path network. Numerous hospitable rest points and breath taking panoramic views make the biking tour perfect. Cyclists appreciate our economic E-Bike-rental – obviously also for mountain trips: there is nothing standing in the way in order to enjoy unforgettable excursions to our wonderful mountain landscape or to remote sights. As our guest in our Hotel Gutjahr you will have the possibility to rent bicycles at a very reasonable price. You have also the chance to rent e-bikes as well as the racing bike „Bulls Night Hawk Team“ and the mountain bike „Ultimate Carbon 26“. Summer in Tennengau – not only sports fun! Besides sport and action, our region offers numerous attractions and sights, which you may not want to miss during your stay at the Hotel Gutjahr in Abtenau. Just think about the wonderful city of Salzburg, the birth place of Mozart: an almost Mediterranean environment welcomes you and a lot of museums, exhibitions and concerts attract culture lovers to our regional capital. Diversified attractions like the zoo or the well known water games of Hellbrunn ensure fun and cheerfulness for young and old. During a city walk through the historical centre you can explore historical buildings, impressive churches as well as the world-known Goldgasse and the Getreidegasse. In the adjacent Salzkammergut with its numerous lakes and the imperial city Bad Ischl, a legendary railway to Schafberg, the idyllic Wolfgangsee or a magnificent panorama view on the Glacier of the Dachstein awaits for you. The biggest ice cave worldwide and the salt mines offer passionate guests of every age a very impressive experience.